Do you have a strong interest in physics and engineering? Start your path to a career in a high-paying, in-demand profession with SRU's Pre-Engineering with PSU program. In cooperation with Penn State University, this dual-degree program gives you the opportunity to receive two degrees: a BA in Physics from SRU, and a BS in Engineering from Penn State. Why Choose Pre-Engineering With PSU? Engineering is an in-demand field with a strong job market. Through the Pre-Engineering with PSU program, you'll gain the skills required for an engineering career-along with the competitive advantage of having dual degrees in engineering and physics from two well-known, respected universities. After your first three years at SRU, you'll continue to Penn State to complete your engineering coursework taught by skilled professional faculty. SRU's Pre-Engineering with PSU dual-degree program will prepare you for a career in engineering-one of the highest-paying, fastest-growing fields in the country. Engineering jobs are expected to grow by more than 10% in the next 10 years, according to the Bureau of Labor Statistics. This program will also provide you with an excellent foundation to enter graduate programs in engineering. 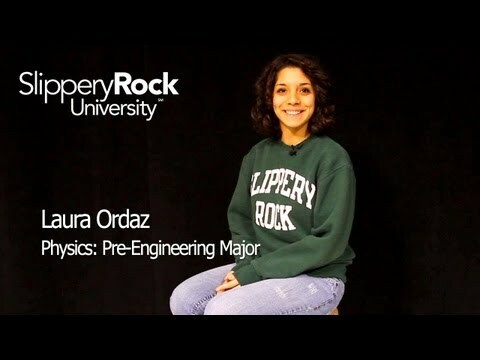 Laura Ordaz a Sophomore, Pre-Engineering/Physics major, talks about the many opportunities for students to get involved on campus through Compass Leadership and many other organizations. She also talks about how these experiences help students figure out who they really are and what they want to do with their lives.